Distribution companies are customer-focused businesses. When one mishap can derail your relationship with a customer, or one miscalculation can cripple your margins, distribution leaders can’t rely on manual, outdated processes to manage their business. As a leader in the distribution space, MIBAR has helped hundreds of distributors to increase margins, decrease costs and take control of their business with advanced software. One of these offerings is Acumatica for Distribution Management, a software created with companies like yours in mind. Acumatica Wholesale Distribution ERP software helps companies manage their distribution activities, including warehouse management, inventory management, and purchasing, and integrate these activities with the company’s financials and sales. Fully integrated with the rest of the Acumatica Suite, this distribution management platform improves the way that you manage sales orders, track inventory, fill orders, purchase products, and provide customer support. As you seek to improve customer relationships, reduce order times, and manage costs, Acumatica Wholesale Distribution ERP software is there to help. Providing user-friendly, robust, and flexible inventory management, order management, and more, this distribution ERP is ready to fit into your unique processes and business model. With real-time looks into available inventory, inventory in transit, and inventory costs with an inventory management system from Acumatica, you can improve service and profitability while reducing costs. With features ranging from lot and serial tracking to expiration dates to purchase order automation, Inventory Management from Acumatica gives you the power to control multiple warehouses, valuation methods, and distribution channels. Order processing software from Acumatica lets you centrally manage sales activities, such as enter quotes, fulfill sales orders, create shipments, track prices, apply discounts, and check available inventory. This allows you the ability to improve ordering, fulfillment, and delivery processes by giving sales and service real-time data using order management software to deliver better customer service. Purchase Order Management from Acumatica empowers your business and helps you to streamline procurement processes to ensure a steady supply of materials while enforcing policy and process controls. Whether you need the ability to simplify the creation of purchase orders, design purchasing practices to unique workflows, or track complex receipts, Acumatica Purchase Order Management can give you the control you need while integrating with a wide range of ERP modules and products. Companies that don’t carry an inventory can use Acumatica Order Management as an alternative to Acumatica Distribution Management. This integrated order management system gives you the tools to deliver better customer service, improve vendor relationships, and eliminate paperwork while providing all stakeholders with greater visibility into order management processes. Know your costs, reduce your order times, and take control of pricing with order management from Acumatica. Automate the way you gather requests, obtain vendor bids, create quotes, approve quotes, manage purchases, and fulfill orders for internal or external clients. With Requisition Management from Acumatica, your business can eliminate paperwork while providing sales, service, shipping, receiving, management, and others with visibility through integration across the Acumatica system. 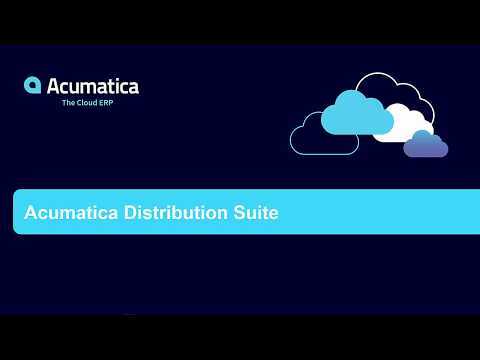 Sold only through an elite network of implementation partners, Acumatica for Distribution Management delivers adaptable cloud and mobile technology with a unique all-inclusive user licensing model, enabling a complete, real time view of your business anytime, anywhere.